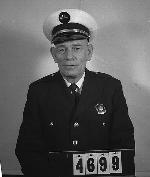 On April 1, 1965, Lieutenant James Cordin of the Chicago Fire Department died from a heart attack on March 19, 1965. Lieutenant Cordin had retired from the Department a month before and was survived by his wife and two sons. Obituary of James Cordin, Chicago Tribune, April 23, 1965.